OREM – Typically, when a close soccer game is impacted by a red card, you would assume momentum would swing in the direction of the team playing with the man advantage. 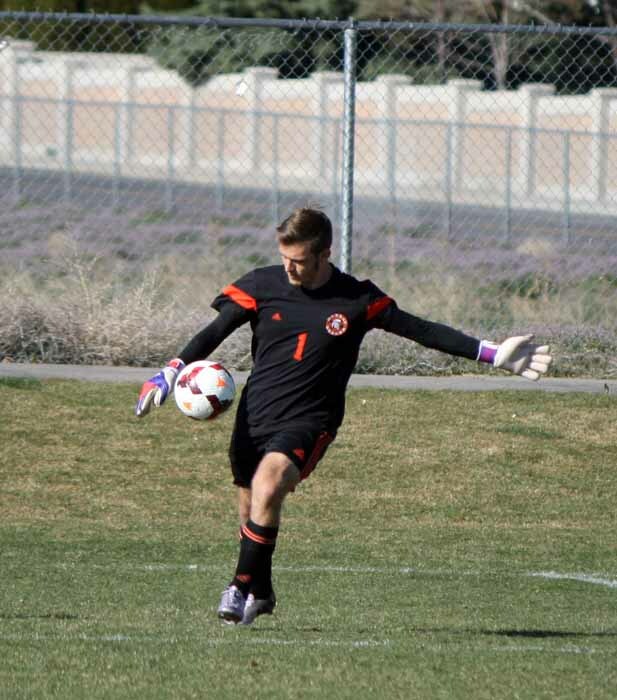 Friday at Timpanogos High, however, the ejection of Murray striker Sam Hansgen in the 32nd minute, had the opposite effect. 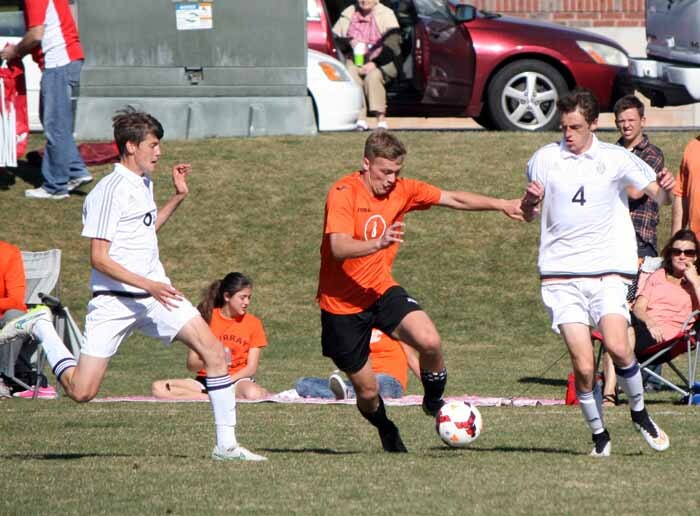 Timpanogos was in control of the action for much of the first half in the Region 7 boys soccer contest, but while the Timberwolves maintained possession of the ball, much of that came in their defensive half of the field. It left the Spartans with scoring chances mostly created in counterattack mode, but neither team really put much pressure on the opposing goalkeeper. After intermission, playing a man down, Murray found the back of the net twice to claim a 2-0 victory over its host. The Spartan style of targeting its strikers and then having them hold the ball forward as they filled in around them seemed to work as well with 10 players as it had with 11. Early on, the Timpanogos backs and midfielders were very strong at playing keep away from Murray, but it mostly led to constant probing and not many strong attacking runs. As the first half progressed, the Timberwolves improved at getting that possession into the midfield and forward into their attacking half of the pitch, but most of the touches for Spartan goalie Tanner Critchfield came either on harmless balls through the defense or passes from his own teammates. Murray did not have a ton of success getting shots on the net of Timpanogos net minder Caiden Brown, but it was a ball hit toward the Timberwolves’ penalty area that seemed to be a game changer. Hansgen pursed a long ball and made contact with Brown, who had come just outside the 18-yard-line to head the ball clear. The contact brought a whistle and a foul call, and after Hansgen and Brown exchanged a hand shake, seeming to move past the incident, a discussion between the Murray forward and the center referee resulted in him putting away the yellow card he originally pulled and replacing it with a red. The call came eight minutes before halftime and seemed to inspire the Spartans. Four minutes later, Brown was called for a foul when he took down a Murray attacker inside the box, and a penalty kick was awarded. Sean Speirs banged the shot off the crossbar and then followed it into the goal, only to have the score waved off because the shooter cannot be first to play the rebound. The Spartan strategy once they went down a player included a switch to a one-striker system, with Speirs running solo up top and his teammates working to feed him balls in dangerous areas to create offensive chances, even without the extra forward. 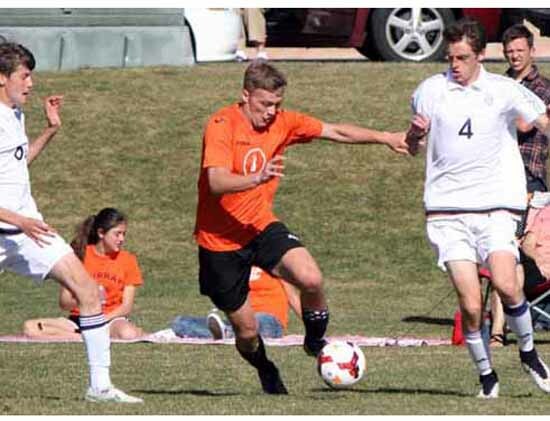 That task was made difficult because the Timberwolves ball control efforts are aided greatly by senior Dustin Henrie and junior Elijah Nimmer, who were very good at shutting down the attack and then initiating the Timpanogos offense from the center of the defense. Speirs was relentless, however, and he was the driving force behind both Murray goals. Just two minutes after the break, a defensive mistake allowed Speirs to play a ball on frame and past Brown, who was coming out to take away the angle on the shot. Seven minutes later, in the 49th minute, Speirs split the defense from the left side of the attack across the top of the Timpanogos penalty area. This time, after doing the work to get free, he found midfielder CJ Sanchez running the right wing and slipped the ball in his direction. Sanchez finished the chance inside the right post to double the advantage to 2-0. From there, it was in the hands of the Spartan defense, anchored in back by Critchfield, with Bradley Baer, Kolby Lee, Walker Erekson and Brayden Berrett in front of him. The Timberwolves turned up the pressure as the second half progressed, but it took so much energy to win balls in the midfield that good scoring opportunities were rare. And where Murray was strongest was in finding its lone striker and holding the ball forward long enough to keep the pressure of playing at less the full strength off its defense. Timpanogos (1-2 in Region 7, 3-3-1 overall) hosts Skyline (3-1, 5-3-1) at 3:30 p.m. Tuesday as it looks to break a two-game losing streak. Murray (3-0, 6-0) continues its unbeaten season, and will now host Mountain View (2-2, 5-2-1) Tuesday as it tries to solidify its hold on the top spot in the region.